A signature steak restaurant located in central London at Beak St & Denmark St, known for its remarkable flat iron steak served with their mini cleavers as cutlery. The combination of great steak and its unique experience makes it one of London’s popular Steak Restaurants. Flat Iron used an expensive restaurant buzzer system (£50 cost per buzzer) to call customers wanting a table in their busy London restaurants. Customer names and pager numbers were recorded on paper and so the process of calling each customer to ask them to return was extremely time consuming. Flat Iron would also lose five buzzers each month (a lost £250). When customers left the restaurant, the buzzers would go out of the range and make a loud noise so customers would throw them away or even forget that they are even in their pockets. Flat Iron used Qudini’s Restaurant Waitlist App as a new tool for their host to add their customers details to the digital waitlist. 1. Customers will get a confirmation SMS confirming their place on the waitlist with a link to a countdown weblink displaying their queue position whilst they wait in a nearby bar. 2. 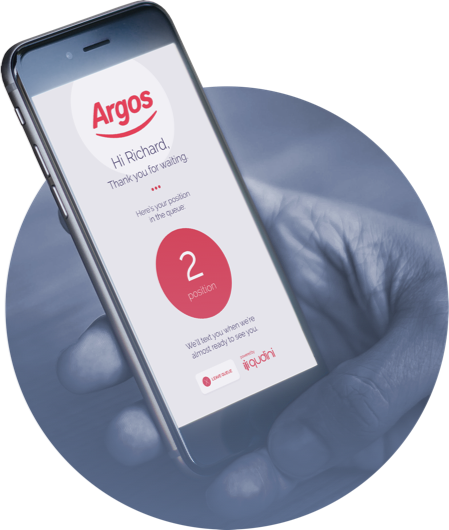 The waiter can continue his work on the restaurant floor whilst managing his waitlist of customers, and letting them know when their table is ready at the click of a button. in additional revenue per restaurant per month, now that more customers are seated in the more efficient restaurant. Extra turns of the restaurant every evening. Now that staff are more efficient, the restaurant is less crowded and customers quickly return for their table.